Composed by Peter Dickson Lopez. 21st Century. Score. 44 pages. Published by Peter Dickson Lopez (S0.7730). MUSIC SCORE - Piano SoloLopez (1950 - ) composed his First Adagio for Piano in 1973. Originally it was included as the middle movement of a three movement sonata, but Lopez felt that the Adagio was strong enough to stand alone, and so extracted this movement as a piece in its own right. In fact, this is the only movement of the sonata that was completed at that time, and Lopez performed the Adagio No. 1 in numerous piano solo concerts from 1973. Lopez ultimately submitted the Adagio No. 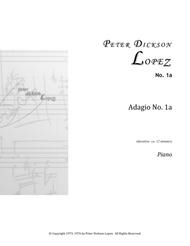 1 as his Master’s Thesis, and it was in part due to the emotional maturity and contrapuntal sophistication of the piece that Lopez was subsequently invited to continue on in the doctoral program at the University of California at Berkeley.In the years following, Lopez planned to write a series of these adagios for piano, and so he later titled this work Adagio No. 1. 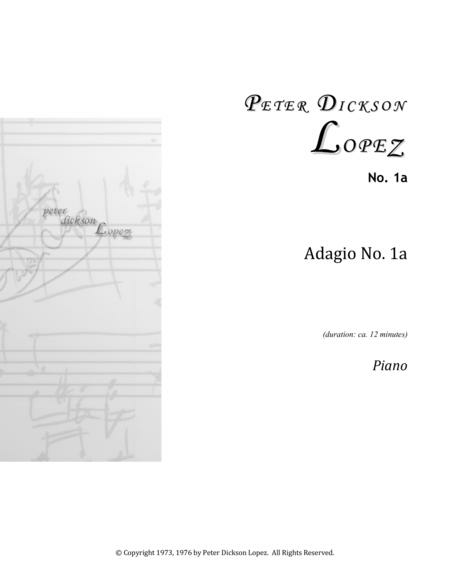 In fact, he jotted down sketches for several other piano adagios but never developed or completed any of these during his early years.Years later Lopez would return to this early piece (Version 1a) to recompose the work for symphony orchestra. The orchestra version (Version 1b) is not merely a “transcription” of the early piece but a true re-rendering of the original concept for a fuller realization of the timbral and contrapuntal implications of the first version. Not satisfied with this, Lopez would go on to compose a third version (Version 1c) of the work for orchestra and piano solo.